Call it Magnolia on a smaller scale without the rain of frogs. Chris Terrio’s ambitious Altmanesque drama centers on a handful of New Yorkers all grappling with relationship issues over a period of twenty-four hours. Based on the play by Amy Fox (who co-wrote the film with Terrio), the film explores the adage usually given to men of the sins of the father going to the son but with the gender reversal it’s a look at the intimate lives of a mother and her daughter that captures our hearts in Heights. Glenn Close portrays Diana Lee—a famous actress (much like Close herself) who divides her busy schedule with teaching, directing and acting while trying not to fixate on the fact that her husband has broken the bounds of their casual open relationship by falling in love with Close’s younger, beautiful understudy. 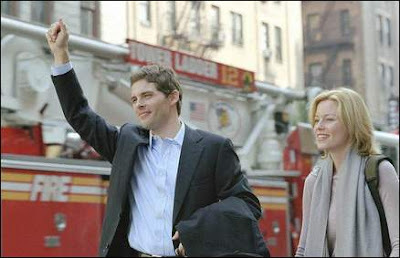 On the same day, we meet Diana’s daughter Isabel (the likable Invincible star Elizabeth Banks), an ambitious and talented photographer who seems to be having second thoughts in her upcoming marriage to handsome lawyer Jonathan (James Marsden) whom she chats with back and forth via walkie-talkies, in a unique and cute alternative to cell phones. We also meet Jesse Bradford’s Alec, a gifted young actor who catches the attention of Diana along with Peter (John Light), a writer working on a famous photographer’s memoirs journeys to New York from England where he meets with the exes of his own male lover (including a small but capable turn by Rufus Wainwright) for an intimate story he’s working on for Vanity Fair only to stumble on some of the same characters in the film who aren’t quite receptive to his questioning. Although some of the film is easy to predict, it still feels true and is so exquisitely crafted by writers Fox and Terrio along with a talented cast that we’re completely taken in by yet another sophisticated and involving Merchant Ivory production—especially considering that this time it was refreshingly made for twenty-first century audiences.